She Sells Seychelles at the Sea Shore! Hi, everyone! You should all feel special. I took a break from playing Plants vs Zombies to write this blog for you all! hahahaha, I’m seriously addicted to that game. I just go through it over and over and over. This is probably my 12th time running the whole gauntlet. Enough about my gaming. Let’s talk polish! I ordered a polish duo from Dave at Octopus Party Nail Lacquer that contained 2 polishes from the summer collection he did for Ella Ann Cosmetics, which was closing up shop. The one I am showing you today is She Sells Seychelles. This polish is a beautiful mauve-y, strawberry pink with a slight sprinkling of holo. 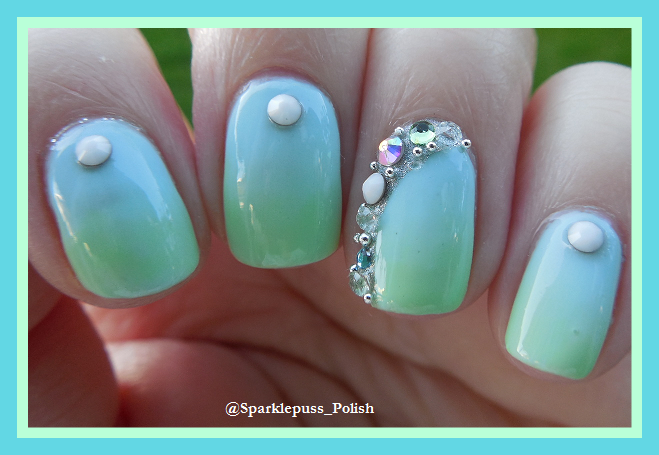 This is a classy polish. Dave does sophistication so well. This is 3 coats of SSS, which is a jelly polish. The formula was superb as always with OPNL. It’s just beautiful, guys. See what I mean? Too much. I was attempting a bubbly look with the caviar beads. It just ended up looking a tad bit messy. This would have been perfect with a silver ruffian or tips at the most. Just like a lot of the polishes from OPNL, I know I’ll be wearing this again. I like the idea of a silver ruffian but I still love the seahorse! Lol that polish name is a mouth full! I love the seahorse accent. I adore how delicate your hand was at the addition of the beads and charms. Quite lovely! I like the color and the subtle holo! Very nice. I only have a few OPNL, but this is pretty!